Bali is a beautiful place. Become top list for vacation and holidays from all around the world, Bali serves plenty of exciting sightseeing and street food to try. Check out the top 10 Bali cuisines that you should try when visiting Bali. Betutu is a Balinese dish of steamed or roasted chicken or duck in rich bumbu betutu (betutu spice mix). The spicer version is available using an extra-spicy sauce made from uncooked (raw) onion slices mixed with red chilli peppers and coconut oil. The betutu spice paste is sautéed with coconut oil to release its aroma and applied to poultry, chicken or duck. Bubur sum sum is an Indonesian dessert made by cooking rice flour in coconut milk and served with palm sugar syrup. There is also a variety served with sweet potato dumplings (biji salak). Bubur ketan hitam, bubur pulut hitam or bubur injun is an Indonesian sweet dessert made from black glutinous rice porridge with coconut milk and palm sugar or cane sugar. The black glutinous rice are boiled until soft, and sugar and coconut milk are added. It is often described as “black glutinous rice pudding”. It is often served as dessert or snack, for supper, for tea time, anytime of the day; however, it is a popular choice for breakfast for those who prefer sweet treat instead of its savory counterpart bubur ayam. Bantal is made of sticky rice and grated coconut along with flavorings such as banana or green or red beans, folded into a banana leaf piece and secured for steaming. The leaf fastener may be a twig, a piece of palm midrib, a sliver of plastic, or even a metal staple. Kopi luwak is the world’s most expensive coffee. The main factor of it’s high price is the uncommon method of producing such a coffee. It has been produced from the coffee beans which have been digested by a certain Indonesian cat-like animal called then palm civet or also civet cat. This is the reason kopi luwak is also called cat poop coffee or civet cat coffee. The feces of this cat will be collected, finished and sold as kopi luwak. Nasi Bali refers to a dish of a scoop of nasi putih (white rice) accompanied by small portions of a number of other dishes, which includes meats, vegetables, peanuts, eggs, and fried-shrimp krupuk. Depending on origin, a nasi campur vendor might serve several side dishes, including vegetables, fish, and meats. It is a staple meal of the Southeast Asian countries, and popular especially in Indonesia, Malaysia, Singapore, Brunei, and southern Thailand, and also the Netherlands through its colonial ties with Indonesia. A similar form called chanpurū exists in Okinawa. This satay is made from minced pork, fish, chicken, beef, or even turtle meat, which is then mixed with grated coconut, thick coconut milk, lemon juice, shallots, and pepper. Muslim travellers are advise to ask before trying this cuisine and can always ask for the halal meat of chicken and fish instead. The spiced minced meat is wound around bamboo, sugar cane or lemongrass sticks, it is then grilled on charcoal. Unlike skewers of other satay recipes which is made narrow and sharp, the bamboo skewer of sate lilit is flat and wide. This wider surface allowed the minced meat to stick and settle. The term lilit in Balinese and Indonesian means “to wrap around”, which corresponds to its making method to wrapping around instead of skewering the meat. Urab sayur (also known as sayur urab, or urap sayur) is one of the traditional side dishes served with nasi campur – an assortment of dishes served with rice. The basic ingredients are usually blanched snake beans (long green beans), bean sprouts (mung or lentil) and spinach or cabbage. The blanched vegetables are tossed with grated coconut, and a cooked sambal dressing of chilli, shallot, garlic and lime. It’s light and delicious, and perfect alongside curry. Bumbu is the Indonesian word for a blend of spices and it commonly appears in the names of spice mixtures, sauces and seasoning pastes. Indonesian dictionary describes bumbu as “various types of herbs and plants that has pleasant aroma and flavour — such as ginger, turmeric, galangal, nutmeg and pepper — used to enhance the flavour of the food. Ayam bumbu Bali means chicken in Balinese spice mixture. Terang Bulan, (lit. :”moon light”) refer to the big round pancake, prior to folding, resembling the shape of a full moon, (in most of Indonesia). Also known by local as “Murtabak Manis”. 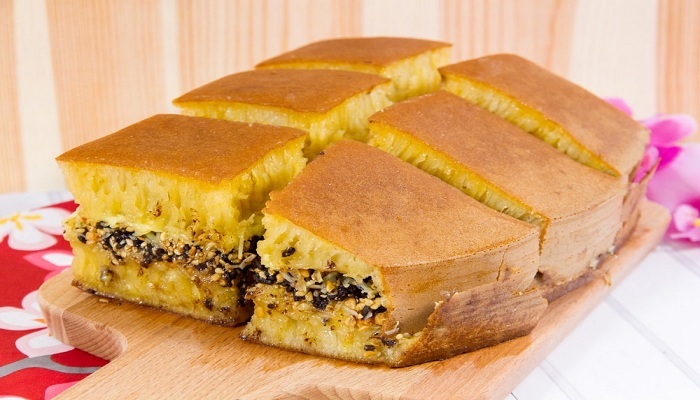 Everyone loves a good martabak manis. Pan–fried to a thick pillowy texture before being stuffed with different kinds of fillings, this pancake is well-loved all around the world. The classic Indonesian delicacy is almost impossible to miss when one is travelling along the streets of Indonesia.